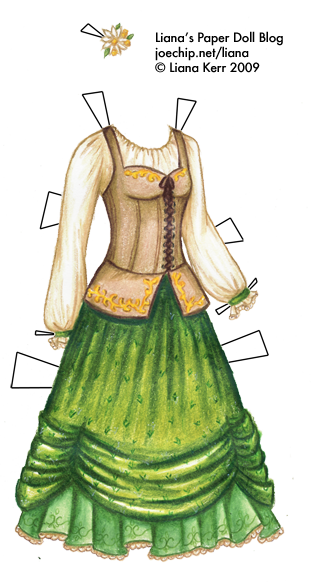 Now, my paperdoll is built a little more like an elf or human, and you will have to draw the hair on the tops of her feet yourself, but she still gets a hobbit dress because hobbits are fun. And they like green! Yes, I’m so there. Poll is still going… fairies could still take it all, but I hope not because I would love to do a week of lavish masquerade gowns… is it bad of me to influence the voting? omg this is one of the cutest gowns ever! This is so hobbit-style! I want to go trick-or-treating in this dress! i love the dress i think your paper dolls are sooooooo cool!! HOBBITS?! I love the hobbits in that movie! I have Ivy and i have lots-o-clothes for her! Yours are the best!